Not to be confused with The Lab, the main lab room inside E. Gadd's home in Luigi's Mansion. Professor Elvin Gadd's Lab is the home of Professor Elvin Gadd. The lab used to be much smaller when it was located on Thwomp Volcano (as seen in Mario & Luigi: Partners in Time); however, after the volcanic eruption destroyed his lab, he moved to a new and improved location in Boo Woods. 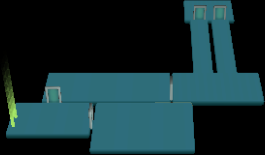 The lab first appears in Luigi's Mansion. It contains a Gallery which used to house all of the ghosts which haunt Luigi's Mansion before the events of the game. In addition, it also has a laboratory, a Portrificationizer Chamber which contains the Ghost Portrificationizer, and a Training Room. This page was last edited on October 25, 2018, at 00:15.